Northern Tablelands MP Adam Marshall, left, and Armidale Regional Council Mayor Simon Murray inspect the inside of the vehicle. ARMIDALE is about to stake its place at the forefront of the development of driverless vehicle technology, with a fully-automated shuttle hitting the road late next month at the University of New England. 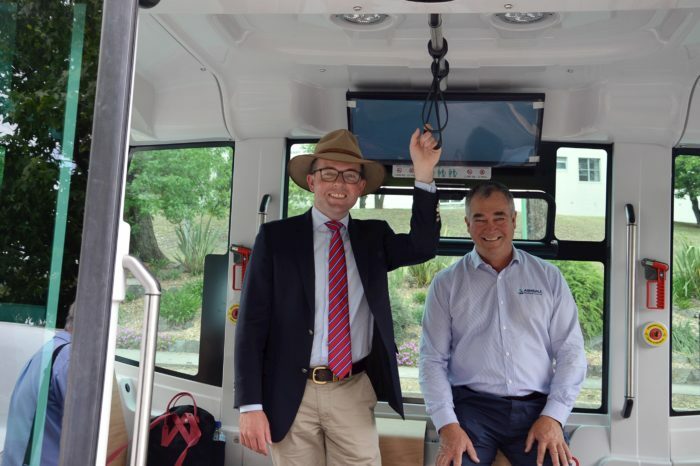 Northern Tablelands MP Adam Marshall was joined by Armidale Regional Council Mayor Simon Murray at the University of New England yesterday to inspect the shuttle while it was being take through its paces, mapping the route it will start traveling next year. Mr Marshall said Armidale was one of just two regional centres in NSW, the other being Coffs Harbour, to host an automated vehicle trial and local drivers and pedestrians were likely to encounter the automated shuttle over the next 12 months as it moved from initial testing and mapping on the UNE campus to a loop in the Armidale CBD. “It’s exciting to see Armidale at the forefront of this cutting-edge technology that will undoubtedly play a big role in shaping the transport network of the future,” Mr Marshall said. “But the automated vehicle trial will also have a direct benefit for Armidale during the trial itself by providing a CBD loop service aimed at helping the elderly and those people with mobility needs. The trial brings together the NSW Government’s own Smart Innovation Centre with partners Armidale Regional Council, UNE, transport providers Edwards Coaches and Transdev, insurer QBE and technology companies EasyMile and WSP. The fully-automated EZ10 vehicle can carry up to 12 passengers. Mr Marshall said the vehicle will be doing mapping at UNE until 21 December and during that time it will be moving at very slow speeds, accompanied by a rolling traffic management team. “Safety is the highest priority for the project team,” Mr Marshall said. “Advisory signage will be in place at all entry points and along the trial route advising road users that they are entering an automated vehicle route.